I have been meaning to share this recipe with you for weeks since my photoshoot with CRE810 Studio. 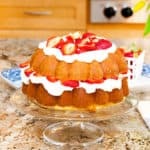 What happens when you take one of my favorite pound cake recipes and stuff it with fresh strawberries and whipped cream? Magic, definitely magic and that magic is called Strawberry Pound Shortcake. This has got to go on your table for Easter. I adore desserts that are simple, country and homemade. Nothing fancy here, just plain ole good sweets made with love from the heart. 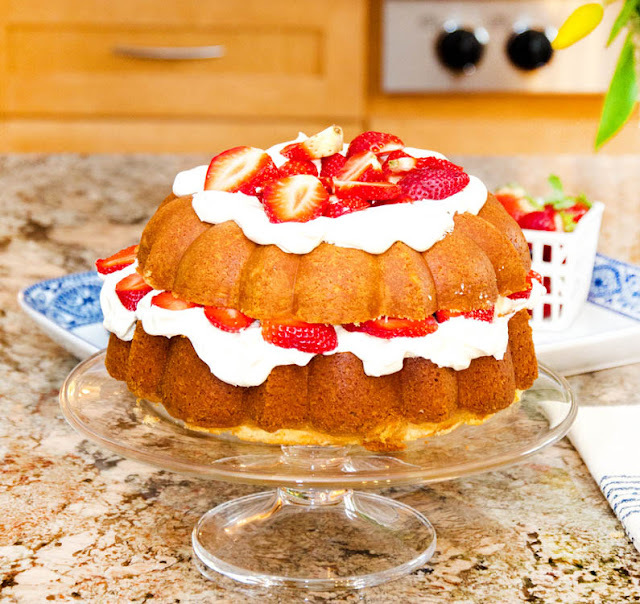 This cake’s magic comes from just letting each component shine, like the strawberries really complement the whipped cream and denseness of this fantastic cake! This strawberry pound shortcake is moist, dense and soft. It literally just melts in your mouth, and you can’t resist the crumbs, trust me. As spring nears, I can imagine this cake making quite a few appearances at holidays like Mother’s Day and Father’s Day. It’s just perfect for a nice family celebration. I hope you enjoy it as much as I do!! 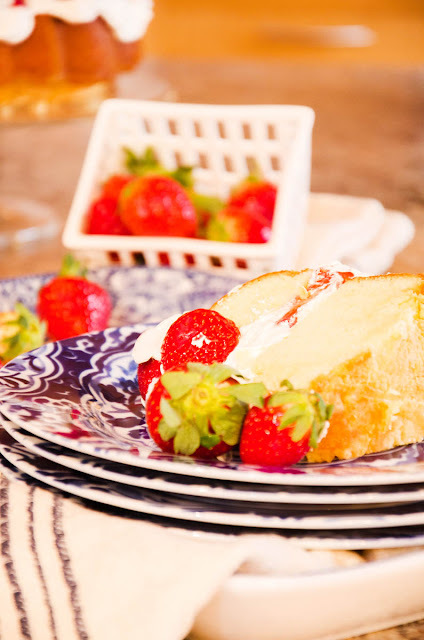 What happens when you take one of my favorite pound cake recipes and stuff it with fresh strawberries and whipped cream? Magic, definitely magic and that magic is called Strawberry Pound Shortcake. This has got to go on your table for Easter. For the pound cake, preheat oven to 325 degrees. Add room temperature cream cheese, salt, shortening and butter to large mixing bowl and begin creaming until smooth. Slowly add sugar to bowl and cream until light and fluffy which takes up to 10 minutes. Add one egg at a time and mix until incorporated. Slow mixer to slower speed and add flour one cup at a time into bowl until just incorporated. Add vanilla extract to bowl and mix. Once everything is incorporated, pour cake batter into greased and floured or baking sprayed bundt or tube pan. Allow to cool in the pan for 10 minutes then remove cake and place on cooling rack. Cake should be cool to the touch (I like to wait at least an hour) before assembling or it will melt the whipped cream. For the whipped cream, add cold water and gelatin to pan and allow to sit until it thickens. Heat on stove over low temperature stirring until the gelatin dissolves. Remove and allow to slightly cool without setting. In a large bowl, beat heavy cream, confectioner's sugar and vanilla until slightly thick. Pour in gelatin mixture and beat on slow until combined. Continue to whip until the cream stiffens up. Remove the top layer and set aside. Add 2/3 of the whipped cream to the top of the pound cake bottom layer. Spread out around the layer. Next add 2/3 of the strawberry slices to the top of the whipped cream. Carefully place the top pound cake layer on top of the strawberries and whipped cream without it spreading everywhere. Next take the remaining whipped cream and spread on the top of the cake and decorate with the remaining strawberries. Hi…I just received your cookbook for Mother’s Day from my hubby…and just discovered your site. I did want to ask you a question about your Strawberry Pound Shortcake which looks devine! My question is about the whipped cream…..you add gelatin. Could you please tell me why you do that…Does it make it a stiffer whipped cream to hold up under the cake? I’m assuming it tastes normal because of the no taste of the gelatin..correct? I appreciate your answer….and …THANKS for the great cookbook and site ! I actually added that so it would stabilize if it is in heat. You can omit it if you would like. I am so happy to hear you like the cookbook and my site! Hi jocelyn. Very lovely site! 🙂 I would really like to try one of your pound cake recipes and I noticed that you have 3 types, where you use either sprite, cream cheese or sour cream. I was wondering how different they are in taste and crumb, and which one you like the best if any. Hi John! Thanks so much. The tastes of the pound cakes are all very different. I will say that the favorite of my family is either the cream cheese one (which I have to make over and over) or the Sprite one when they want a citrus flavor but you can’t go wrong with either. The sprite one has a lighter texture than the cream cheese and sour cream ones overall though. I think the pound cake can be made a day or two inadvanced, but can it be assembled and refrigerated overnight. Also, what type of knife did you to cut this cake. Hi Jackie, the cake can definitely be made in advance. You can also do the assembly the night before since the whipped cream is stabilized. I used a serrated knife. Let me know if you have anymore questions. One of my favorite cakes ever! LOOOOOVE. Great shots. 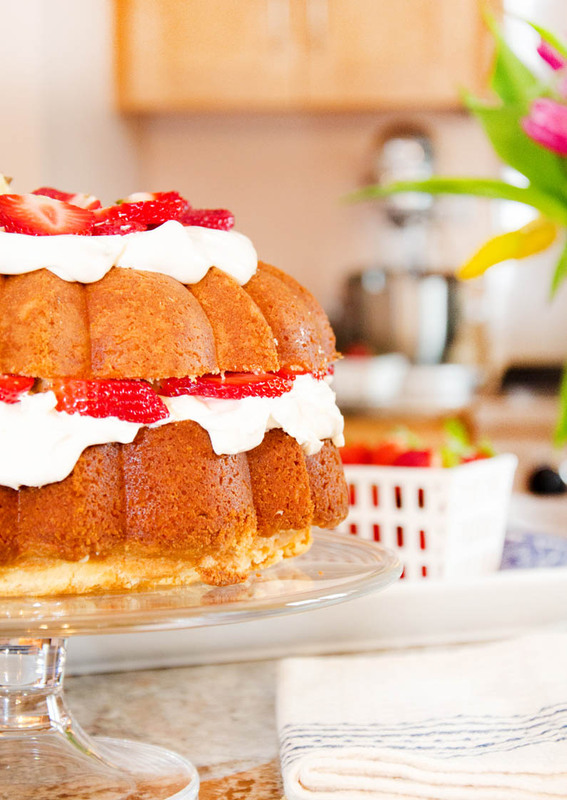 I want to take a fork and dive right into this gorgeous strawberry pound shortcake! Absolutely lovely, Jocelyn!!! Thanks so much Carol! I love taking a fork and diving into dessert! Looking at this bundt cake I forget there’s snow on the ground. I’m dreaming of summer! Gosh, I am dreaming of summer too!!! Nothing better! This is a gorgeous cake! Omg, I would gobble this up in a second. I do love simple desserts such as this also. Sometimes simplicity is best! Absolutely! Simplicity is sometimes the best way to go in desserts! Definitely wondered how you got the whipped cream to sit like that. Leave it to you to use a little magic. That’s such an interesting method. Thanks for sharing it. Fab photos by the way! This is one of most people’s favorite desserts. Thanks so much! Awww that whipped cream fooled you. It definitely tried to ooze out but oh how delish. Thanks so much McKenna! I would not mind a slice myself! What a lovely prelude to spring! I love the idea of turning a bundt cake into a layer cake! It totally makes me think of spring. I can’t wait for spring to come now! !